It used to seem easier to spot the polluters. There were the usual suspects: Industrial pipes pumped toxic chemicals into the water; dams blocked the way for salmon; natural resources were over-harvested. Those problems still persist, but ecosystem management in Puget Sound has become increasingly complicated since the 1970s and 1980s. Scientists now recognize that what happens on the land is intricately tied to the health of the water. We face climate change and unprecedented population growth, and scientists have identified thousands of different human-caused pressures on the ecosystem. The headlines include new threats like stormwater, emerging contaminants and widespread declines in species and habitats. Given limited resources, how can managers and policymakers make informed decisions about where to focus their recovery efforts? 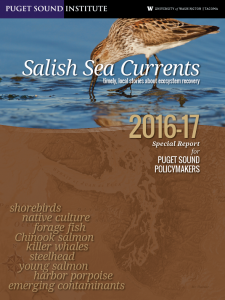 To help with this, we have created a new collection of stories from Salish Sea Currents. This is our second booklet of this type, and it includes reporting on new and emerging science that we believe everyone should read. The stories are wide-ranging, but, like an ecosystem, are connected in important ways. 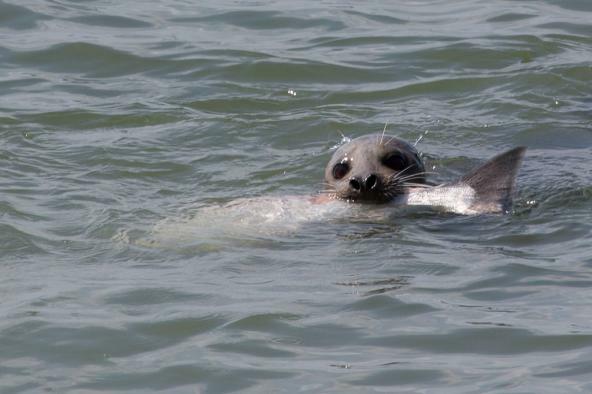 We start with a look at the impacts of seals and sea lions on the region’s threatened Chinook populations. As many as one in five juvenile Chinook are eaten before they can migrate to open waters. That means many fewer are maturing to adulthood and returning to spawn. It also means significantly less food for the region’s endangered killer whales, which depend on Chinook for about 81% of their diet. It is a classic illustration of the food web. Seals and sea lions have been increasing due to federal protections, but they have always had a healthy appetite for salmon. Are they the villains here, or is something else at play? Scientists suspect a variety of threats make the Chinook more vulnerable to what should otherwise be a normal pressure. Contaminants in the water as well as habitat loss from shoreline armoring are just two examples of threats that could be weakening Chinook, and we have several stories in this collection that intersect. Not everything is bad news. We close out the collection with a story about the return of the harbor porpoise. Known as “the puffing pig,” the harbor porpoise had all but disappeared from Puget Sound in the 1970s due to factors like gillnetting and industrial pollutants. The species is still considered to be at risk in the Salish Sea, but its population is on the rise and it is hoped that Puget Sound cleanup efforts can ensure healthy numbers in the future. It is just one reminder that we can make a difference if we understand the ecosystem’s problems and their causes. Good science reporting can help to build that understanding, and we hope this collection of stories continues that tradition. You can download the 44-page report as a PDF, or contact us if you would like a print version. We’ll also have many new stories in the coming months on the Encyclopedia of Puget Sound. Funding for the report was provided by the Environmental Protection Agency.